Dr. L.D. Britt is the lead editor of Acute Care Surgery textbook. Dr. L.D. Britt Inducted into Inaugural Academy of Educators. Dr. L.D. Britt Honored in Suffolk. Facing surgery can be one of the most stressful experiences in anyone's life. Within days of diagnosis, patients can see a number of unfamiliar healthcare professionals, which can be exhausting if the providers are in several different locations. It can be overwhelming. The surgeons of EVMS Medical Group understand. 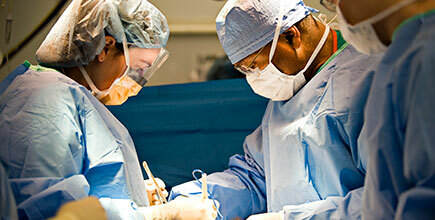 Our surgeons are the only Level 1 Trauma surgeons in Hampton Roads, Virginia. The advantage to patients of choosing a surgeon who is dedicated to treating patients in emergency/crisis situations and can do exceptionally well with elective yet challenging problems, cannot be overstated. As full-time faculty at Eastern Virginia Medical School, our surgeons have virtually immediate access to each other, and to every researcher and specialist on the EVMS faculty, as well as the comprehensive resources of an academic medical center. This multidisciplinary team approach means our surgeons work together, often under the same roof, to ensure the smoothest, most seamless care. In most cases, patients can see several providers in one visit. EVMS Medical Group surgeons are nationally and internationally recognized for their expertise and skill - and acclaimed for their clinical research, education of students and residents, and patient care. Many hold national and international positions in their specialty societies and are considered leaders in their fields. Our surgeons are accredited by the American College of Surgeons to teach students through multidisciplinary simulation training. Groundbreaking research, possible only in an academic setting, combined with state-of-the-art patient centered quality care, provides a level of service and knowledge unmatched by other medical service providers.